This is my third blog post on the subject of Christian persecution in only a few hours. I did not set out to post about this subject, but here I am. These acts are barbaric and our silence or apathy is neither helpful nor are they the "Christian" thing to do. I have not insert the videos from this WND story, that are to gruesome for me. I can't bare to watch them. If you are so inclined you can go to the original story. I am inclined however to suggest that not only do we keep these matters in prayer, but that we bring them before our churches, and encourage our Pastors and Ministers to speak to their congregations about what is happening throughout the world in an ever increasing frequency and brutality. Perhaps we here in America will seek to assemble ourselves to pray for those being murdered viciously for the sin of believing in Jesus Christ on a regular basis. We would desire this if it were our natural family that this was happening too, and it just as important when it happens to our spiritual family, to which we are all tied by the Body of Christ. Al-Adlubi reported witnessing Armenians who were waiting their turn to be slaughtered. An “Egyptian butcher … grabbed the neck of one elderly Armenian Christian,” Al-Adlubi said. The report blames the “gruesome systematic human extermination centers” of the Islamic State of Iraq and the Levant, or ISIS, a radical Islamic organization in Syria and the Middle East. Al-Adlubi is described in the report as a Muslim fundamentalist who joined the Free Syrian Army and was a militant and a media agent for FSA. He was captured but later “made it out when the Syrian militia” defeated the rebels in that location. “You are ‘murtad’ (apostate),” he was told. “I asked him, what is my destiny. I want to get a closure. What is it, a year two years in prison?” Al-Adlubi said. Shoebat said several Arabic language news sources, Alwatan, AlJazeera and Mufaker, corroborated some of the details. Reported Shoebat: “The prison centers where the ISIS (Da’ish) controls have become miniatures of what was during the Nazi SS extermination camps, except the ISIS carries out the extermination in a much more horrific way. Da’ish transforms the prisons into kangaroo courts with systematic slaughterhouses and killing centers to exterminate Christians and Muslims who disagree with the Takfiri ideology. 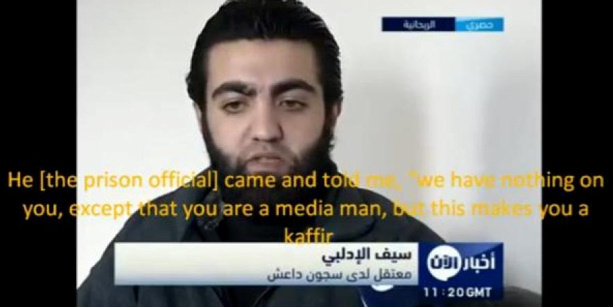 Once they are found guilty, the way they deal with the victims was as if they were cattle.” He said a Syrian Christian named Kamil Toume also confirmed the reports, with video, purportedly of the Siba district slaughterhouse in Homs, Syria.